As summer approaches, we know many martial arts studio owners can easily start to worry about student retention. With summer sports, camps, and family vacations it can be hard to keep students engaged. To help you prepare, we put together three unique ways to retain students in the summer months. With implementing just these additions to your summer schedule, you can minimize the start of summer’s student attrition. Summer daycares are booming with new kids. Working parents need to keep their normal schedules, so daycare centers have an influx of children under their care. Most of these daycare centers are looking for new and entertaining ways to provide value to their kids. What better way to help them learn a new skill than by creating a summer martial arts class? 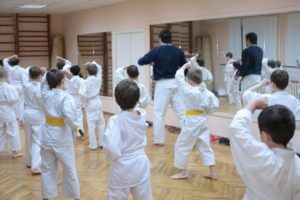 Reach out to your local daycare centers and offer a few different day-long special karate or taekwondo skill classes for every age level in the daycare center. Make the classes fun and include something like ninja training, board breaking, or sword training. These classes are also an opportunity to get in front of potential new students that have never been exposed to martial arts before. Be sure to bring brochures with a special promotion for signing up for classes at your martial arts studio during the summer months. One easy and fun way to add more student classes is to offer a Date Night for parents where they can drop off their kids for a few hours in the evening while they enjoy a night kid-free. During those hours, create a fun-filled class, then have pizza delivered and play a movie afterwards. Parents will appreciate the free time they have and will come to know your studio as more than just a place they send their child to learn martial arts, but also a community with positive influencers and a place for them to make friends and spend time in a safe and healthy environment. Don’t let the return of summer scare you. Yes, student retention can be a real issue because of the hustle and bustle of other summer activities and vacations, but utilizing these three ideas for retaining business will help make sure your revenue not only remains the same, but has the potential to increase during summer months.